And how your talent can be your capital. It’s the last month of the year and it’s considered to be the month for entrepreneurs. December is all about Christmas to an ordinary Filipino, but for an entrepreneur, it’s the month for profit, profit, and more profit! After all, they say nobody celebrates Christmas the way Filipinos do. A lot of aspiring entrepreneurs launch their businesses during the Christmas holidays when people are in a good mood to spend, especially in the food and retail sectors. 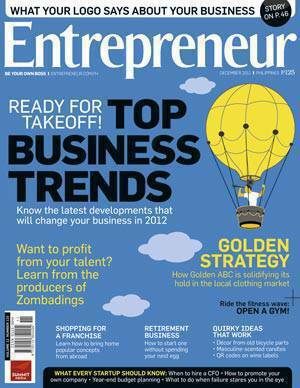 To help you start your entrepreneurial journey, Entrepreneur Philippines is featuring the Top Business Trends for 2012. We do not only want you to start your business on the right foot, we want you to start your business with the right trend. From tourism, retail, franchising, property and real estate, to larger investments like manufacturing, BPO’s, and call centers, Entrepreneur Philippines gives you a sneak peek of what 2012 will look like for businesses. Unknown to many, one brand that has remained under the radar is changing the way clothing brands are doing business in the country. Bernido Liu’s GOLDEN ABC Inc. is all set to lead the clothing industry into a more exciting future. The company counts popular local brands Penshoppe, Regatta, Forme, Memo and Oxygen in its stable. Learn how they are expanding their company through various brands that cater to different segments of the market. Being creative is one attribute of a successful entrepreneur. This is what defines the four artist-entrepreneurs that featured in the December issue. Whether you are doing film, visual art, or music, your creative juices can be the capital you need to start your business. And since its Christmas, Entrepreneur Philippines also lists 7 gifts that are truly worth giving this season. creati creating value creative concepts creative problem solving December 2011 issue Entrepreneur Philippines Penshoppe, Regatta, Forme, and Oxygen Top Business Trends for 2012.